Bob Hoover was known as the “pilot’s pilot” — one of the greatest to have ever flown. He learned his skills as a fighter and test pilot for the Air Force and is best known for revolutionizing modern aerobatics. As a crack flyboy, Hoover understood risk better than most. And it was this firm grasp of calculated risk-taking that allowed him to become one of the best aerobatic pilots in the skies and still live to the ripe old age of 94. There’s an old trading adage that goes “There are old traders, and bold traders, but no bold old traders.” Like the pilots that “cut their margins too close”, markets are constantly claiming the accounts of those who recklessly risk their capital in search of easy profits. Here’s a rule of thumb to live by: Your margin of risk is dependent on your experience. But no matter how deep your experience, never cut your margins too thin that you risk hitting the ground. First and foremost, trading is about survival. And to survive, you need to protect your capital. Many traders, especially inexperienced ones, fly way too close to the ground. This makes their blow up an eventuality. Newer traders don’t respect risk because they haven’t gotten burned badly enough… yet. On average our team at Macro Ops risks a fraction of 1% per trade. This will not only protect you from fighting the powerful headwinds of negative compounding, but it’ll keep you alive and in the game. Stay alive and you can continue to grow. Continue to grow and maybe someday you’ll acquire the skills to become an ace. I got my tail clipped roughly ten years ago. 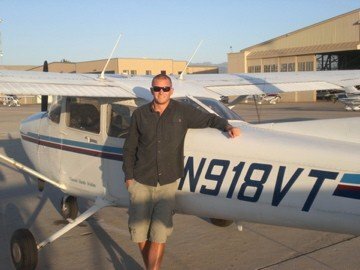 Getting your tail clipped is when they cut off the tail of your shirt after your first solo flight (the photo is of me after my successful landing). My first solo was supposed to take place a week earlier than it did. But it was cancelled. As I was going through my pre-flight checklist that morning, there was a horrible crash on the runway. Another student working towards his pilot’s license botched his landing. Unlike other students flying slow and easy Cessnas, he insisted on learning to fly in a P-52 Mustang. The difference is like learning to drive a Toyota Camry versus a drag racer. He was learning on a powerful machine… like a trader learning to trade while using too much leverage. When coming in to land, he knew he wasn’t going to stick it, so he tried to do a pass through. A pass through is when you push the throttle and climb back into the air to circle around and try again. He put his throttle all the way in — on a Cessna this is fine — but on a P-52 Mustang the engine is so powerful that the torque flipped the plane over. The pilot stuck the landing on his head. The crash was fatal. As traders we’re not dealing with anything as serious as our lives — it’s just money. But to make it in this game, you need to take the preservation of your capital just as seriously. Keep your margins wide. Stay well above the ground and carefully calculate risk. Only press the leverage as you gain the experience. If you want to learn how our team at Macro Ops manages risk, then check out our Trading Instructional Guide here. A Review Of George Soros’ “The Way Ahead” Lecture A Dovish Hike and a Third Step Before a Stumble?